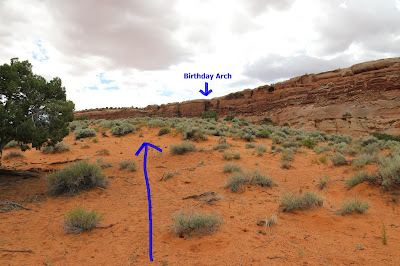 Birthday Arch is located in Kane County, Utah just west of the town of Big Water. The arch is located high up on the cliffs along the western side of Bucktank Draw. 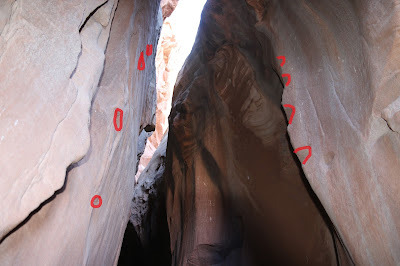 On the opposite side of the canyon there is a short narrow slot canyon that is also fun to explore while in the area. 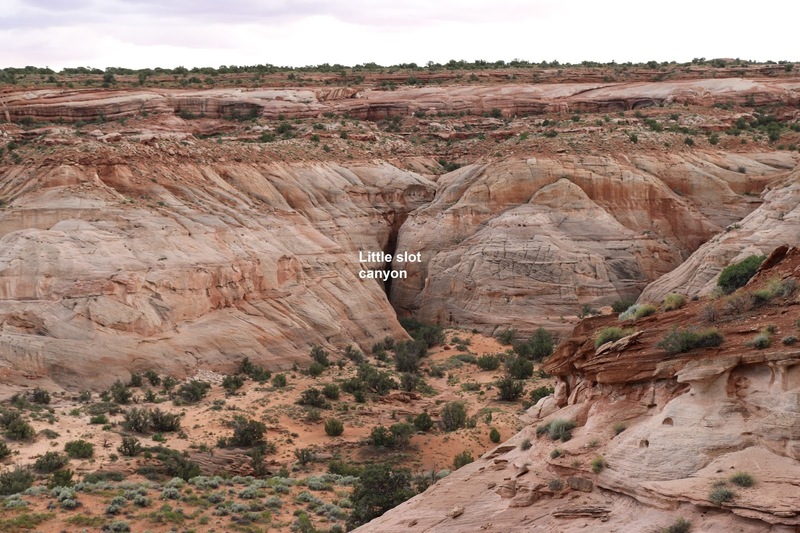 The little slot canyon is only about a 100 feet long but getting to it doesn't add much more in the way of difficulty to the hike. The trailhead for Birthday Arch is no more than a pullout at the west end of the guardrail at the 9.75 mile marker of US Highway 89. (There isn't actually a 9 3/4 mile marker but there is a 10 and there is a 9 so you can figure it out from there.) The Park Service lists it as 17.3 miles west of the Carl Hayden Visitor Center in Page, Arizona. There is enough room along the shoulder of the road for 3 or 4 vehicles to safely park out of the way of traffic. From the parking area follow the trail along the road toward the wash where there is gate to pass through. The trail drops into the wash which becomes the route for almost the next 2 miles. The wash varies between a sandy bottom and stretches of slickrock. Multiple spillovers are encountered as the route progresses up the wash. The first couple are easy enough to scramble over but the third requires climbing out of the bottom of the wash on the right side to get around. It is all easy enough to accomplish so it is no big deal. 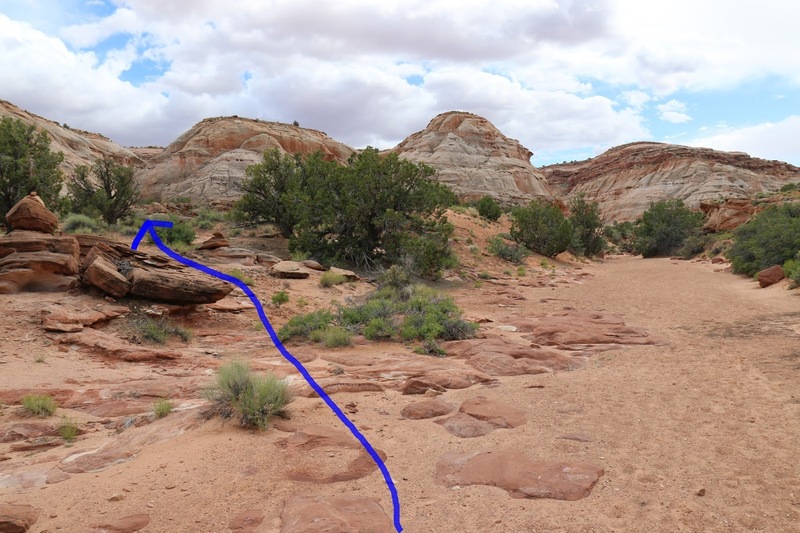 The route around the spillover is kind of fun and a nice break from the bottom of the wash.
Stay in the wash to about the 1.8 mile point where the first good place to leave the wash and hike up to Birthday Arch comes up. There is at least one cairn up on the slickrock that marks this spot. Unfortunately the BLM hasn't put up any official trail markers and lots of spurious trails are popping up that not only are confusing but they don't lead to the arch. As you climb up the slickrock and out of the wash follow the trail that leads up the sandy sage covered ridge. Stay on the ridge and avoid following any other trails even if you see fresh footprints on them. 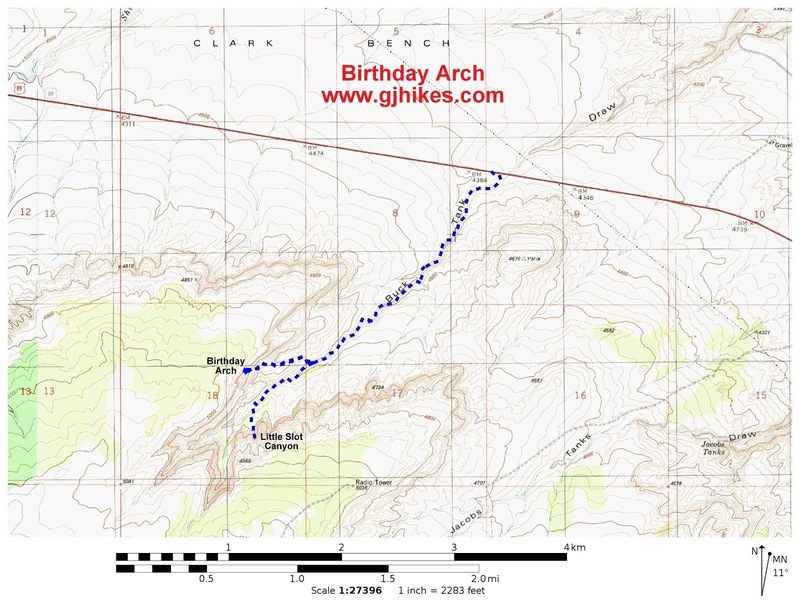 If you hike past the ridge and into the next wash you will have to make a steep climb to get back up the ridge to get to the arch. As you hike further up the ridge and proceed over the crown of the hill the arch can be spotted along the rim of the cliffs. The arches opening isn't very apparent until you are right beneath it. If you want to get right under it you will have to pick out a route to scramble up some sandstone ledges. From the arch you can look across the valley and spot the Little Slot Canyon. 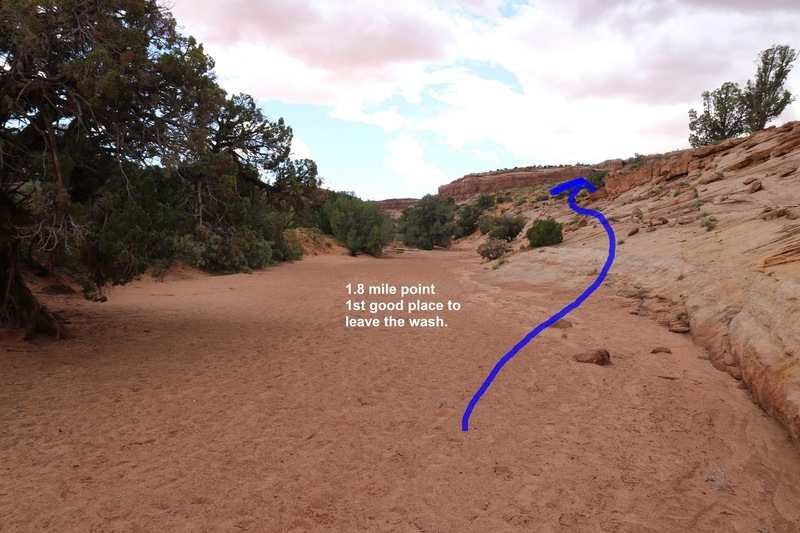 The Glen Canyon website suggests cutting cross country to get to it but all that is doing is making more confusing trails since nothing official is marked out. We chose to hike back down to the wash the way that we came and then follow the wash up to the slot. The only real obstacle in the wash between the arch route and the slot canyon is another big spillover that needs to be hiked around. 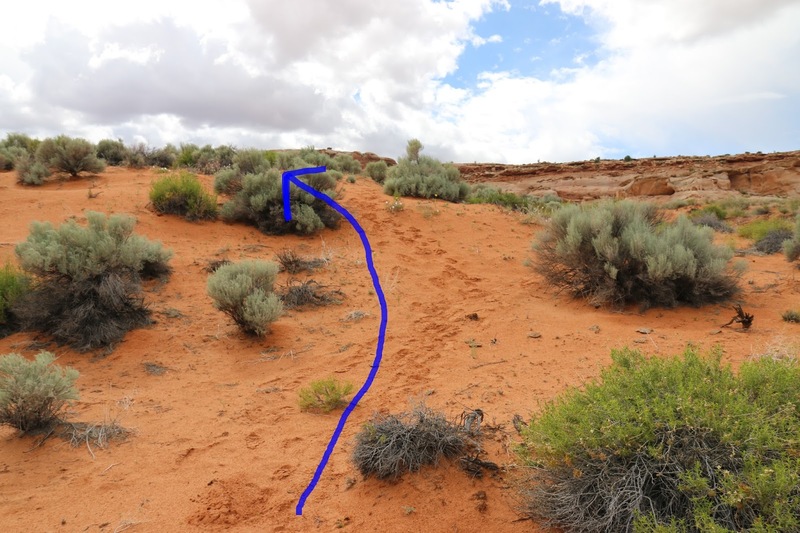 The sand is loose along the hillside but it is only a short distance so it is also no big deal..
As you approach the area of the slot you can either turn up the shallow wash that will be on your left or go just past it and look for one of several small cairns that mark another route. If you turn up the wash you will have to climb out of it anyway to get to this trail. The mouth of Little Slot Canyon (we decided to name it) is clogged with foliage that is easy enough to hike through. We usually carry a pair of clippers so that we could spruce up such places but we didn't have them for this hike. The slot is short but it is nonetheless fun to poke around. An interesting aspect of the slot, besides a petroglyph, are some holes and notches that are carved into the sides of the walls that were apparently used to climb up the chute. Kinda makes you wonder what's up there doesn't it? The hike back down the wash trends in the downhill direction which makes for a very enjoyable trek back to the highway. The parking area can be seen in this last photo and even though it isn't an official pullout they seem to have spread a little extra gravel for a makeshift one. 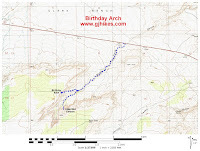 For those that happen to be in the area and are looking for a fairly easy hike that takes less than a half day and leads to an arch and a little slot canyon then the Birthday Arch trail was made for you. If you would like to see it for yourself then all you have to do is 'Take a hike'.